Join us for one of the region’s largest social events for career-minded and community-focused young professionals. Ignite the Night gathers hundreds for an evening of networking and learning about opportunities with the Leadership Louisville Center. Alumni come together to reconnect and introduce friends and colleagues to the Center. You’ll enjoy a first peek at our amazing new facility, hors d’oeuvres fit for foodies and thanks to our amazing sponsor, a complimentary Brown-Forman cocktail! At the brand new Leadership Louisville Center, 707 W. Main St.
Join our email list – we’d love to keep you posted about future opportunities for leadership development and civic engagement with the Leadership Louisville Center. 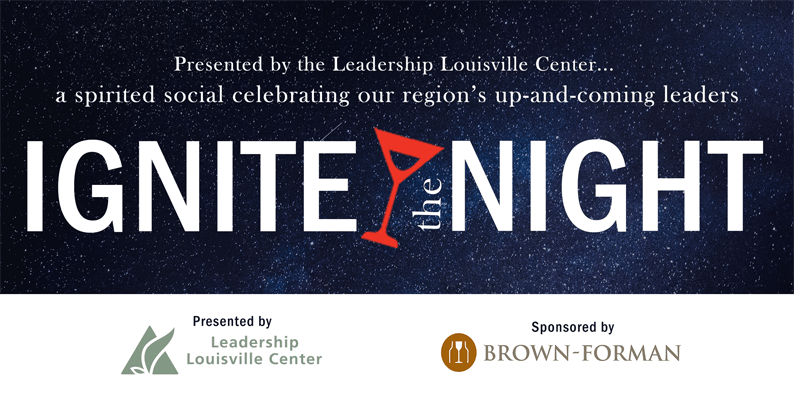 Ignite the Night 2018 is presented by the Leadership Louisville Center in partnership with Brown-Forman Corporation.